Your message here - contact fybush.com to reach thousands of NERW readers every week! TOWER SITE CALENDAR 2008 - NOW AVAILABLE!!! TUESDAY UPDATE: A surprise format change in New York - at 4 PM Tuesday, Emmis pulled the plug on smooth jazz WQCD (101.9), relegating "CD101.9" to the station's HD2 channel (which wasn't even on the air at launch time) and replacing it with a classic rock-leaning AAA format (they're calling it "adult rock"), as "101.9 RXP, The NY Rock Experience." New calls are WRXP, and there's at least the start of a new staff - Brian Schrock is shown as music director and afternoon host on the station's new website, while Blake Lawrence remains on board as PD. Much more in next week's NERW - and you can hear the very first WRXP legal ID over at our sister site, Tophour.com! *It's been a popular parlor game in eastern MASSACHUSETTS radio circles for more than a decade now - when will Greater Media flip formats on its perennially ratings-challenged AAA station, WBOS (92.9 Brookline) - and to what? If you had "February 1, 2008, at 5 PM" in the pool, and "classic alternative" as the new format, congratulations - you've just won something. If, on the other hand, you had "WBOS disc jockey" after your name, the news isn't so good. The newly-renamed "Radio 92.9" has parted with its entire airstaff, with no plans to replace them any time soon. Off the air completely are afternoon jock John Laurenti (late of WHJY in Providence), night guy Dominick Lewis and overnight voice Paul Jarvis, as well as the station's weekenders, including Holly Harris and her Sunday night blues show. Morning host George Knight is gone from that shift, but his Sunday morning show remains in place. And middayer Dana Marshall is off the air, but she drops "interim" from her PD title and continues programming the new station. So what's this "classic alternative" business all about? Our best guess here at NERW is that it's a play to siphon off some of the older listenership to Boston's other "alternative" rockers, WBCN (104.1) and WFNX (101.7) - but after years of rumors about more dramatic format changes at 92.9, in particular some very credible reports that the station was on the verge of going sports a few months back, there's reason to believe that Greater Media didn't have any long-term plans of sticking with the long-running triple-A format, which had been running in one form or another on WBOS since its 1989 flip from country. *Even before WBOS made its surprise Friday flip, we were planning to lead this week's column with a Boston format change: last Monday morning (Jan. 28), regular listeners to the conservative talk on Salem's WTTT (1150 Boston), what few there were, awoke to a shock - instead of the lineup that included Bill Bennett, Sean Hannity, Dennis Prager and Hugh Hewitt, WTTT's 5000-watt signal was running Spanish-language religion as "Radio Luz." In just over four years since launching its talk format in November 2003, WTTT never achieved significant visibility or ratings in the crowded Boston talk arena, despite several stabs at local talk and the addition of WBZ castoff Paul Harvey. "Radio Luz" enters a fairly crowded field, too, with Spanish-language religious programming already airing in the market on WESX (1230 Salem)/WJDA (1300 Quincy), but the leased-time programming will at least provide some steady revenue to bolster Salem's bigger signals in town, religious WEZE (590 Boston) and WROL (950 Boston). One more Bay State note: translator W260AS (99.9 Lawrence) has signed on, relaying MAINE Christian contemporary station WMSJ (89.3 Freeport) - but its signal, from the Haverhill tower of WCCM (1490 Haverhill)/WXRV (92.5 Andover), is reportedly having some big problems reaching listeners in Lawrence itself, thanks to Spanish-language religious pirate "La Voz de Fe," which has been on the air for several years there, complete with a website that's more comprehensive than many licensed stations' sites. GETCHER 2008 TOWER SITE CALENDAR - BEFORE THEY'RE ALL GONE! Still haven't ordered your 2008 Tower Site Calendar? You do realize that it's now...er...2008, don't you? We're already down to the last 110 or so calendars, and they're going fast. The 2006 and 2007 editions of the calendar sold out, and this one will do so as well, possibly as soon as this month. This year's edition is a particularly fine one, if we do say so ourselves. From the cover photo of KAST in Astoria, Oregon to the back cover shot of the Blaw-Knox diamond tower at WBNS in Columbus, this year's calendar features 14 all-new full-color shots of famous broadcast sites far and wide. There's KROQ in Los Angeles, KFBK in Sacramento, WESX in Salem, WGAN in Portland, Black Mountain in Vegas, Mount Spokane in Spokane, and many (ok, several) more. 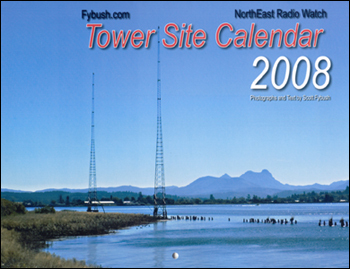 The 2008 Tower Site Calendar is dedicated to the memory of Robert Eiselen (1934-2007), whose digital imaging skills made even a bunch of pictures of radio towers look almost like art. His contributions were essential to the calendar's evolution from 2003 to the current edition, and he will be missed dearly. *Speaking of out-of-state religious broadcasters, California's EMF Broadcasting is getting its first toehold in NEW HAMPSHIRE, with a $1 million purchase of WMEX (106.5 Farmington) from veteran New England broadcaster Dennis Jackson. Jackson tells NERW that the station wasn't even for sale when the unsolicited offer came in, and he says the station's oldies format and its staff (including VP/general manager/morning man Gary James) will stay in place until the deal, brokered by Doug Ferber of Star Media Group, closes. The historic WMEX calls will stay with Jackson, for use on another station eventually. *There's a new local talk show coming to two CONNECTICUT sports stations. Clear Channel's WPOP (1410 New Britain/Hartford) and WAVZ (1300 New Haven) will debut "The Back Page" on Feb. 18. The 3-7 PM show will be hosted by Jason Page, formerly of Sirius' sports channel. Miss our complete look back at the year that just ended? Have you caught (and responded to) our Year-End Rant yet? We'll be printing some of your responses in this space next week - and in the meantime Click here for NERW's comprehensive recap of 2007. * It was a big week for program directors in NEW YORK City, with no fewer than four PD chairs changing hands. Perhaps the biggest of the announcements was at Clear Channel's WWPR (Power 105.1), where Clear Channel Boston operations manager Cadillac Jack was named the station's new PD, replacing Helen Little. She heads across Sixth Avenue to fill the midday shift on WLTW (Lite 106.7) left vacant by Valerie Smaldone's departure - and as Clear Channel continues to shave budgets in any way possible, Cadillac will keep his OM position in Boston, commuting back and forth between the markets. Downtown at Emmis, WQHT (Hot 97.1) PD Ebro Darden increases his workload as well, taking the PD reins at sister station WRKS (Kiss 98.7) formerly held by Toya Beasley. Over at the competition - Inner City Broadcasting's WBLS (107.5), PD Vinny Brown is out after more than a decade with the station, with no replacement yet named. After numerous delays, New York's newest radio station is getting closer to its debut. "Pulse 87.7," which is actually the audio signal of low-power TV station WNYZ-LP (Channel 6), is now promising a debut within the next week or so, and it's named a PD. Consultant Joel Salkowitz, who's programmed WQHT (Hot 97.1) and WTJM (Jammin' 105.1), will head up the programming at the signal. There's been no announcement of any jocks beyond morning team Star and Buc Wild. 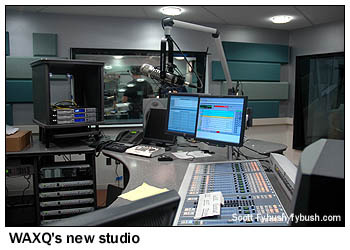 Back at Clear Channel, move-in day is approaching at the new cluster studios at 32 Avenue of the Americas, just south of Canal Street, that will eventually house all five of the group's New York City stations. First to make the move to Lower Manhattan will be WAXQ (Q104.3), which has been camped out at the WWPR studios since the lease ran out on its own Midtown studios a couple of months ago. Q has already been doing some overnight broadcasting from the new studios, and the official move will take place this week if all goes well, with the other four stations (WLTW, WWPR, WHTZ and WKTU) to follow over the next few months. There's a changing of the guard atop New York's public television behemoth. On Friday, former NBC News president Neal Shapiro officially succeeded Bill Baker as president and CEO of the Educational Broadcasting Corp., parent to WNET (Channel 13) and WLIW (Channel 21), after a year-long transition period. Baker will remain as president emeritus and as the face of WNET's pledge drives, and we wish him all the best in his new role. *Moving upstate, Frank Truatt's WTBQ (1110 Warwick) has finally found a way to overcome one of its biggest obstacles - a 500-watt, daytime-only signal that leaves the station off the air during drivetime for much of the winter. Bud Williamson's Digital Radio Broadcasting, which owns translator W256BD (99.1 Warwick), has been granted Special Temporary Authority to put WTBQ's programming on the 10-watt 99.1 signal, 24 hours a day. In Utica, Galaxy is bringing its Syracuse morning team of Gomez and Dave back to the FM dial. The duo (based at Galaxy's WTKW/WTKV in the Salt City) had been heard on WRCK (107.3 Utica) before Galaxy sold that signal to EMF Broadcasting. Since the sale, they've been on the "Team" sports trimulcast of WTLB (1310 Utica)/WRNY (1350 Rome)/WIXT (1230 Little Falls), but as of Friday, they're the new morning show on WOUR (96.9 Utica), where they replace Indianapolis-based Bob and Tom. In Albany, financial problems at Young Broadcasting meant multiple layoffs at WTEN (Channel 10) last week. The Albany Times Union reports that the cuts, which came just before the start of the February ratings sweeps, included anchor Alyssa Van Wie, sports director Brian Sinkoff, meteorologist Chris Gloninger and reporter John Craig - and that in all, ten employees lost their jobs at WTEN. Young is coping with money woes that may include a sale of its biggest station, KRON in San Francisco, taking a loss of more than $500 million from its $820 million purchase of the station almost a decade ago, and NERW hears more cuts at Young's other stations, including WTEN, may be in the offing. There's a format change coming a week from today in Rochester, as Crawford Broadcasting prepares to migrate the standards/oldies "Legends" format from WLGZ (990 Rochester) to sister station WRCI (102.7 Webster), which currently broadcasts contemporary Christian as "the Light." That's a very crowded niche right now, with competition that includes regional broadcasters Calvary Chapel of the Finger Lakes, Family Life Ministries of Bath and Mars Hill Network from Syracuse, as well as EMF's national "K-Love" network. Once the new "Legends 102.7" launches next Monday morning, we're told 990 will remain as a partial simulcast of the FM signal, breaking away for leased-time programming that already includes the market's only Spanish-language broadcasts, now heard weekend evenings on the AM side. Congratulations to WBEE (92.5 Rochester) middayer/music director Weslea - she's now the country station's assistant PD, also! Where are they now? Former WKLX/WBBF morning man Ellis B. Feaster has found a new morning gig in Orlando - he's now with contemporary Christian WPOZ (Z88.3) after many years at country WWKA (92.3). A veteran of the Albany radio and TV dials has died. George Lezotte came to WTRY (980 Troy) as a DJ in 1957, later serving as the station's PD and news director. In 1962, Lezotte moved to WTEN (Channel 10), where he spent a decade as a reporter and anchor. After several years working for a state agency, Lezotte returned to WTRY and sister station WPYX in 1981, where he worked as news director until 1991. Lezotte died last Sunday (Jan. 27); he was 81. You can have your ad here! Click here for information on the most economical way to reach tens of thousands of Northeast radio and TV people each week. *A northeast PENNSYLVANIA market manager is moving on to a bigger market. After seven years at the helm of Entercom's Wilkes-Barre/Scranton group, John Burkavage was named VP/market manager of the company's Greenville, South Carolina cluster on Friday. No replacement has been named yet in Wilkes-Barre. *A NEW JERSEY call change that slipped by us at the end of 2007: WGBZ (105.5 Cape May Court House) quietly changed calls to WSNQ on Christmas Day. There's been no change to its "Buzz" rhythmic top 40 simulcast with WZBZ (99.3 Pleasantville/Atlantic City) so far, and maybe there won't be - it's been more than a year since sister station WDTH (93.1 Wildwood Crest) changed calls to WEZW, sparking rumors of a split from its simulcast with "Touch" urban AC WTTH (96.1 Margate City), but so far those stations remain in simulcast mode. And while the AM dial in Kingston, Ontario has been silent for a couple of weeks now, the physical remains of one of the city's defunct AM signals just disappeared from the Wolfe Island skyline. The four-tower array of CKLC (1380) came down last week, leaving just a temporary tower standing for the new CKLC-FM (98.9) until a new permanent tower for the station can be built on the former AM site. We're told the nearby six-tower array of the equally defunct CFFX (960) will come down in late March or early April, to be replaced by a wind farm. The FCC's continuing to deal with the flood of applications it's received under its new "one-step" rules for moving radio stations' cities of license - and that means a few more interesting applications in PENNSYLVANIA and NEW YORK for us to tell you about this week. The biggest application in this week's batch comes from Cumulus, which filed to move WFAS-FM (103.9 White Plains) to Bronxville, New York. For now, WFAS-FM will stay put at its current transmitter site in Greenburgh, just off the Sprain Parkway, but NERW expects a subsequent application to move the station's transmitter within New York city limits. Meanwhile, out at the other end of the state, Farm and Home Broadcasting is applying to get WFRM-FM (96.7 Coudersport PA) out of its economically-troubled hometown and into the larger Olean market. Coudersport was the home base of Adelphia Communications, and the economic boom there under the Rigas family has quickly gone bust, with the collapse of the company, the convictions of its founders and the impending closure of the Adelphia call center that provided much of the town's employment base. While WFRM (600) will stay in Coudersport, the FM side wants to cross the state line to Portville, New York, running 460 watts at 155 meters from a communications tower on Savage Hollow Road in Olean. In other news from around NEW YORK, the new "Fresh FM" (WWFS 102.7 New York) has added its first air talent. Long Island native Mike Perry, formerly of WOLL in West Palm Beach, will take the 3-8 PM shift at Fresh. On Long Island, WLIE (540 Islip) has flipped from business talk to Spanish religion under Otto Miller's Principal Broadcasting Network, which is LMA'ing it from Stu Henry's Long Island Multimedia in anticipation of a $14 million purchase. Heading up the Hudson Valley, Pamal took over from Clear Channel on Thursday at WBPM (92.9 Saugerties) and WGHQ (920 Kingston). At WBPM, Clear Channel's oldies are out, and classic hits are in. No airstaff have been announced yet, except for a website mention of Jack Hammer in morning drive. Randy Turner's in the PD chair. As we'd predicted last week, progressive talk is now a thing of the past in New Haven, CONNECTICUT, where Clear Channel flipped WAVZ (1300) to ESPN sports on Sunday afternoon at 4, just in time for that big football game. CONNECTICUT's longest-running morning team hung up their headphones last week after nearly two decades on the air -- and not completely willingly. It's been no secret for the last year or so that Bruce Barber was looking to leave the "Smith & Barber" morning show on WPLR (99.1 New Haven), but it still came as a surprise to listeners when the show was nowhere to be found last Friday morning. Station officials say Barber had mentioned several times that he was getting bored with the show; they considered keeping co-host Brian Smith as a solo act, but decided instead to buy out the rest of the duo's contracts. The decision came as a surprise to Smith, who tells Connecticut media outlets he wasn't expecting the show to end when it did. The show's sidekicks, Megan Doll and Billy Winn, will stay on board when WPLR's new morning show launches later this month. Chaz and AJ come to the Cox rocker from Barnstable's WRCN (103.9 Riverhead) on Long Island; Chaz is a former night jock at WPLR. MASSACHUSETTS is home to one of the two stations in America whose call letters are the same as its city of license (WACO in Waco, Texas being the other) -- and listeners to WARE (1250) in Ware have something new to enjoy this week. New owner Success Signal Broadcasting (helmed by Marshall Sanft, former owner of WESO in Southbridge) launched an oldies format on WARE Saturday, featuring veteran central Massachusetts jock Fred King in morning drive, a daily "Polka Hour" from 11 to noon (and all morning on Sunday), and an interesting lineup of local talk shows on Thursdays, Fridays and Saturdays. Dennis Jackson (of WQQQ/WMEX/WRIP fame) has a hand in this one too; he and programmer Jay "Biggie" Fink are behind the deep, deep oldies format on the 5000-watter, which blankets the territory between Springfield and Worcester. Down to NEW JERSEY we'll go, next, to find another change of simulcast at Millennium's cluster in the Atlantic City market. WKXW (101.5 Trenton)'s talk programming moved last year from WBSS (97.3 Millville, now hot AC "Mix" WIXM) to WKXW (1450 Atlantic City, the former WFPG) -- and at the same time, the hot AC moved from "Shore" WKOE (106.3 Ocean City) to WIXM. WKOE became CHR "Hot 106.3," but it didn't last; as of Saturday, "Hot" is gone and WKOE now carries the simulcast from "New Jersey 101.5." What of WKXW(AM), then? It's now doing ESPN radio, still with Harry Hurley's local morning show. From PENNSYLVANIA comes word that oldies station WPAM (1450 Pottsville) went dark on Friday. The station had been under a five-year LMA to crosstown WPPA (1360) and WAVT (101.9), but when that expired, there was nobody around to run 1450. We hear it'll be back under new management, eventually. Philadelphia's WURD (900) is being sold as part of the gradual spinoff of Mega Communications' non-core properties; the kilowatt daytimer (now with 42 watts at night) goes to Levan Communications, which we hear is associated with the former owners of crosstown WHAT (1340). Expect the black-oriented talk that's been running on a leased-time basis to continue under WURD's new ownership. Sinclair Broadcasting is leaving the Burlington-Plattsburgh TV market, just a few months after arriving. You'll recall that Sinclair is buying the broadcast properties of Heritage Media from Rupert Murdoch. Yesterday, Sinclair said it will sell WPTZ (Channel 5) Plattsburgh-Burlington and WNNE (Channel 31) White River Junction, along with the LMA to WFFF (Channel 44) Burlington, to Sunrise Television for $72 million. Sunrise is the "small-market" television arm of media giant Hicks, Muse, Tate, and Furst. Elsewhere in the region, it owns WKTV (Channel 2) in Utica and WROC (Channel 8) in Rochester. Through its LIN Television arm, Hicks, Muse also owns WTNH (Channel 8) New Haven and WIVB (Channel 4) in Buffalo. The broadcast scene in VERMONT was a busy one this week even before the WPTZ deal was announced. Up-and-coming rocker WCPV (101.3 Essex NY) is bringing back the "Corm and the Coach" morning show that was dropped last fall by rival WIZN (106.7 Vergennes). The show will replace Don Imus in morning drive on "Champ 101," with the I-man reportedly moving down the dial to WXPS (96.7 Vergennes). Over at WIZN, station manager Mike Bussiere is reportedly taking over the morning airwaves of "The Wizard." In MASSACHUSETTS, Keating Willcox has applied for new facilities for his WNSH (1570) Beverly. The station has been cranking out 125 watts, non-directional, from a rooftop antenna in Hamilton. Now, it wants 500 watts from a four-tower array on the Endicott College campus in Beverly, with different patterns day and night. A quiet week in NEW YORK...just another TV sale to Lowell Paxson, that's all. As part of an eight-station buying spree, Paxson's getting WAUP (Channel 56) in Syracuse for his PaxNet. The unbuilt CP had belonged to Syracuse Minority Television. In Albany, Mason and Sheehan are back to being FM-only; the simulcast of their WXCR (102.3 Ballston Spa) morning show on WTMM (1300 Rensselaer) has been replaced by One-on-One Sports. You can sponsor this weekly feature! Click here for information! NorthEast Radio Watch is made possible by the generous contributions of our regular readers. If you enjoy NERW, please click here to learn how you can help make continued publication possible. NERW is copyright 2008 by Scott Fybush.